Good morning, gladiators. I hope I don’t sound like I’m panting, but I just finished my first rookie CrossFit training session. K.O. instructs Carrie Pride on the proper way to do an overhead press with chains weighing 30 pounds at Darkside Athletics. K.O. gives support as Carrie Pride does a lateral jump over at her morning training session at Darkside Athletics. 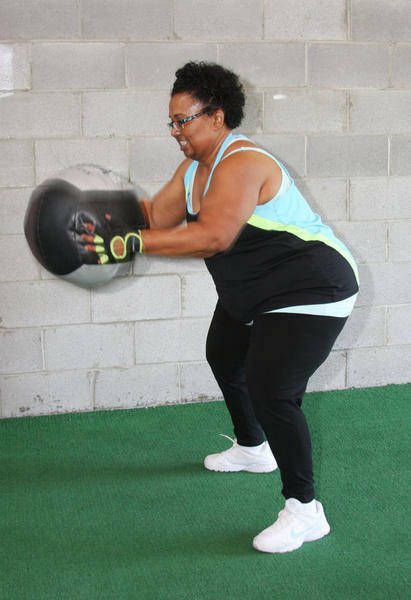 Carrie Pride sweats it out with medicine ball slams at a morning training session at Darkside Athletics. 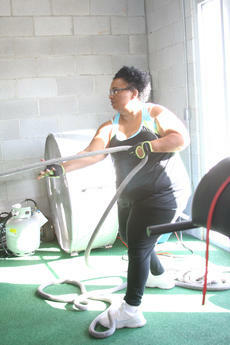 Carrie Pride pulls a sled in the early morning sunshine during a training session at Darkside Athletics. For those of you who are just joining me on my quest, I have been working with my trainer, Kerry “K.O.” Overfelt, of Darkside Athletics and Bourbon City Fitness, on a six-month weight loss and fitness journey. So let’s get down to it, people. It has now been 12 weeks, and through a nutrition plan and training program designed for me, I have lost 25 pounds and 22 inches overall. And to show my victory, I modeled at the Chamber of Commerce spring fashion show in clothes from Peacock on Third in downtown Bardstown. Honestly, I am proud of what I have done so far and amazed of what I am capable of doing. “I want you to think for just a moment on what you have accomplished today and in CrossFit and how far you’ve come in three months,” K.O. told me. My best moment during the past few weeks was breaking my threshold of time on the stair mill. I was so emotional afterward. I couldn’t believe I did it. K.O. was out of town, and I’m sure he was glad he wasn’t there to see me get all teary-eyed. Don’t get me wrong, I am still not a fan of the stair mill, but at least I know I can do more. My energy level has definitely increased this last month. I am continuing my low-carb program. However, K.O. started me on a micro-fast regimen for a couple of weeks. 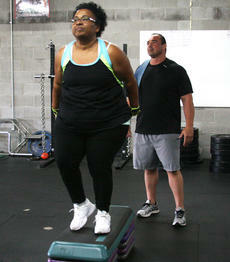 “Usually after about 3 months, you hit a plateau and I knew she was going to need a boost to get over this hurdle,” K.O. said. Your body adjusts very quickly to change and “I try to keep your body guessing,” he said. In addition to a low-carb diet, the micro fast provides your basic macro nutrient needs with fewer calories at certain times but still provides the necessary nutrients for your body, he added. Losing an average of two pounds a week, along with 22 inches, is a big deal, K.O. said. That puts me on target for where K.O. feels I need to be. I’m dropping body fat and with my diet and training I am stronger and able to do more intense sessions, which helps burn more fat as an energy source, K.O. said. There is a difference between a workout and training, K.O. explained. With a workout, you show up at the gym to get your heart rate up without a real goal, which is better than not doing anything. But with training, you have a specific goal to attain and if you are going to do something, you should go all out for it. “Just maintaining is not getting better,” he said. “I need Carrie to know I expect more out of her as we go on and I will be harder on her,” K.O. said. And I want him to be. I won’t say this has been easy, it’s not — by any means. But K.O. always says if it doesn’t challenge you, it won’t change you. “I have to be hard, and I can’t just let you have this one moment because the ultimate moment is yet to come. If I don’t expect much, I won’t get much,” he said. The change over the last several months has been more than physical. “My biggest joy is watching her come from this insecure woman stepping out of her comfort zone to this crazy little spitfire that now thrives on a challenge and almost welcomes my craziness,” K.O. said. He is intense, but as a trainer he has to be. “Like a general, I can’t rest. I look ahead at the long term where I want to win the war,” K.O. said. “She needs to win the battle to gain confidence and to get to where she needs to be,” K.O. said. I am far from an expert, but I do advocate that you make time for yourself. I have a full-time job and two part-time jobs. I train for 30 minutes at least four to five days a week. It only takes a small portion of your day to become a more fit and healthy you. This is it for the rest of my life to keep getting better and stronger. So Gladiators, to end this update in true “Olivia Pope-fashion” — It’s handled people! Failure is not an option and I refuse to go back to that gloomy place, a former shadow of myself. I truly believe the light came through for me on the Darkside. Kerry “K.O.” Overfelt is a certified personal trainer and strength and conditioning coach with 22 years of weightlifting experience. He is the owner and operator of Darkside Athletics, a former high school strength and conditioning coach, and the current strength and conditioning coach at St. Catharine College for several of its teams. Additionally, he was a standout college football player, previously competed in bodybuilding and strongman competitions and is currently one of the top-ranked professional Highland Games athletes in the world.